For full effect, Read this Entry on Storify. Last week, the “Democrat Recruiting Group” headed up by Jeanne Bonds via her sockpuppet account, @MovingNCForward, teamed up with @GregFlynn to publish my name on Twitter. The blowback was significant for them; less than a week later we see a new Twitter acct, @NCBLONDES to take over recruiting. This is a little story of what happens when Liberals attack on Twitter. Mind you, this has happened before but this time they took aim at me. Then fast forward to last week, where Stacy McCain of The Other McCain catches up to the #NCblondes and their antics. My own accounting included the backstory as well. Twitchy caught up with the action as Sister Toldjah unloaded in an epic diatribe detailing the hypocrisy and total lack of #SelfAwareness exhibited by the #NCblondes aka #TeamDumDum. 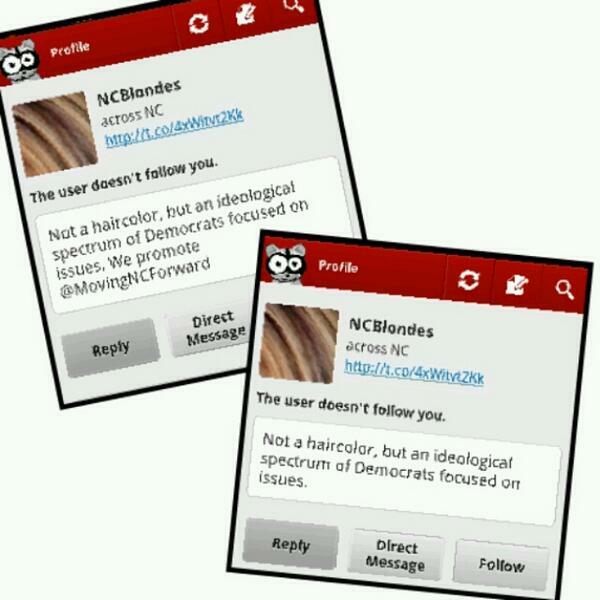 #ncblondes thinks they can slap some new paint on a new twitter acct and it all goes away. 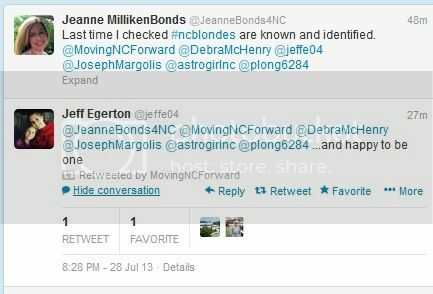 Now it seems that @MovingNCForward and @JeanneBonds4NC have had to re-group and have created the account @NCBLONDES. Same group, with a new coat of paint…and a coat that has changed a few times just in the last few days. This morning, @NCBLONDES was all about promoting @MovingNCForward. Thank you, Sister Toldjah for pointing it out for all of Twitter to see. Meanwhile, when confronted about being an ‘Anonymous account’ tweeting the promotion of another ‘Anonymous account’ while ignoring they posted my real name online, @NCBLONDES went into spaz spin mode asking me for the names of donors to various Right-leaning groups. Bizarre to say the least. They persisted that they have listed their members “over and over”. @NCPoliticalSpin @LadyLiberty1885 We are a GROUP and have listed our members over and over. Read. We are not an anon blogger. Instead, @ncblondes dodges. Won’t list who tweets for that acct or for MovingNCfoward. They have never listed their full names in one place for who tweets at @MovingNCForward or for this new account @NCBLONDES, but it was perfectly fine to Dox me and publish mine. The Hypocrisy is mind melting. Also, @NCBLONDES didn’t dox me. Somebody else built that dox…or something. Gee, then who did? RT @NCBlondes: . @LadyLiberty1885 @NCPoliticalSpin No one in this group “doxed” anyone. Have a good day. #ncpol #ncga. At the end of the day, it’s the same players different name. All roads lead back to @JeanneBondes4NC and her latest failed attempt at #branding. I’m a little shocked she didn’t just call me a “HouseWife” and be done with me. to hold her personal information over her head didn’t go over so well. yours, people can still see through it all to the rust underneath. This entry was posted in Err What?, Nanny State, New Civility, Non-Profit, patriotism, Senate 2014, Stay Classy and tagged NCBlondes. Bookmark the permalink.